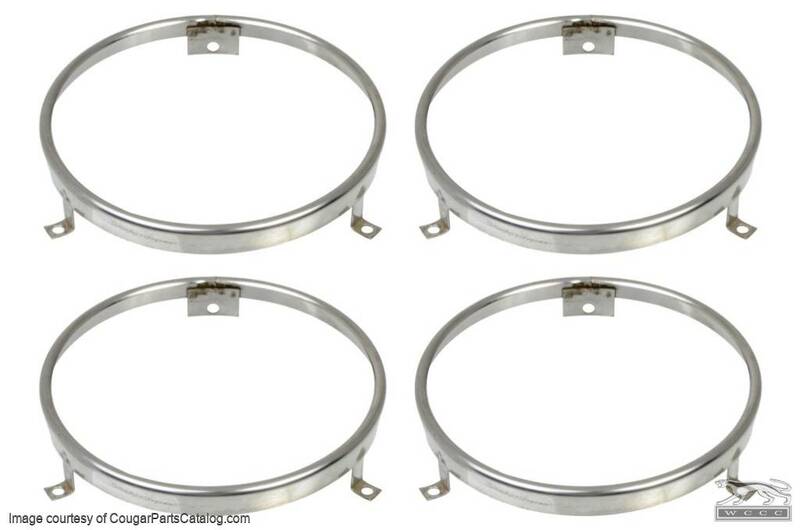 Good Used Headlight Retaining Ring SET OF 4 for the 1967 through 1973 Mercury Cougar. 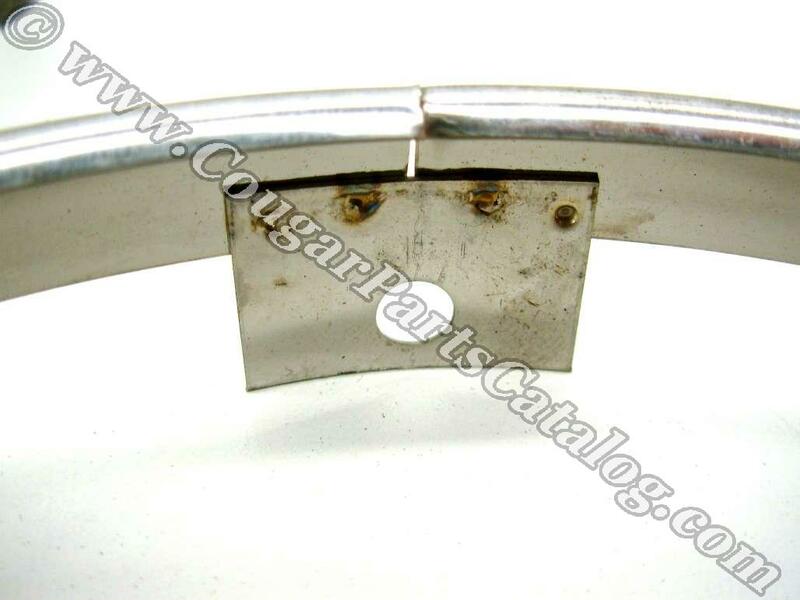 These are the correct ring for all years 1967 - 1973 high beam or low beam. No dings, gouges or broken spot welds. They are held in place by a spring and two screws. 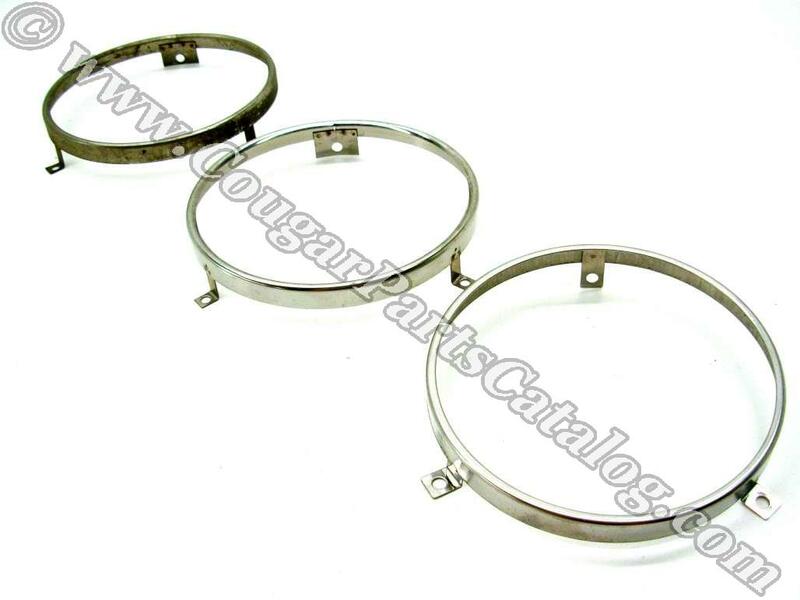 Made from stainless steel, these clean up nicely with fine steel wool. 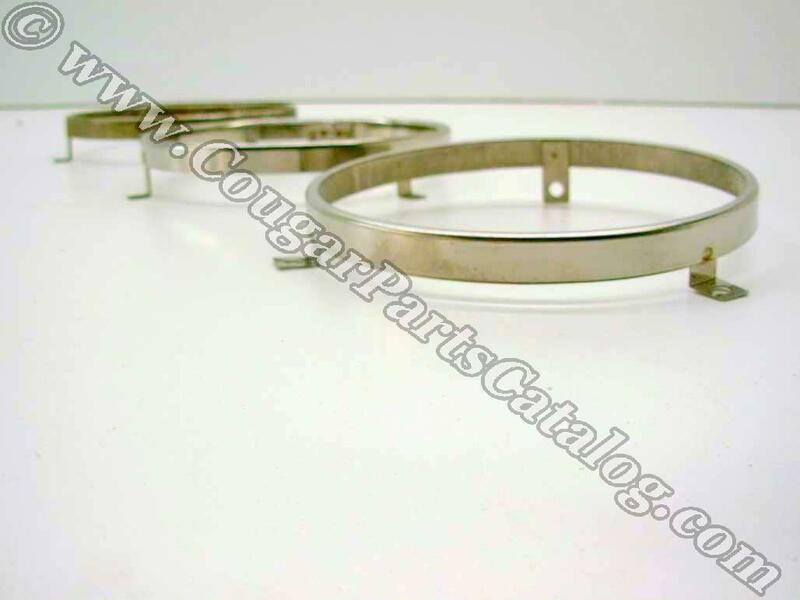 The above picture shows the Used (top left), NOS (center), and Repro (bottom right) Headlight rings side by side. If you look close at the above picture you can see that the Repro leaning while the NOS and Used are level. Above is the NOS arm that attaches the ring to the headlight bucket. Below you can see that the repro is almost 3/8" shorter. This makes it so that the repro WILL REQUIRE longer screws to attach it to the headlight bucket. Above is the NOS Spring Anchor Tab. As you can see if you compare it to the picture of the repro below, it is much wider than the repro. 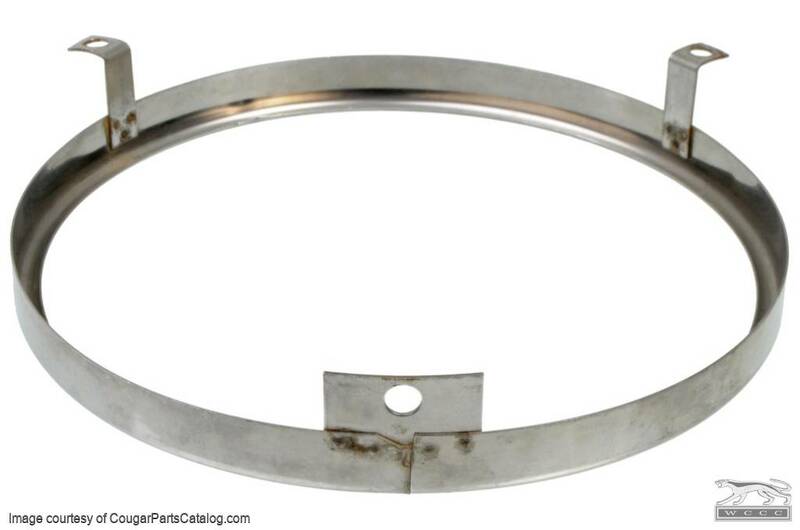 You will also notice that the repro is a single piece with no joints, where as the Used and NOS are tack welded to the spring anchor tab. Another difference to note, is that the repros have a brushed finish, whereas the NOS and Used have much more of a shine to them when they are polished up. The 50-year-old headlight rings on my car and very brittle and prone to splitting when I stress them while changing headlights. It's good to have a few spares around. Ordered the set of 4 used rings a was pleasantly surprised. After a bit of cleaning up with steel wool they look brand new. Takes a bit of time replacing them but they work great & look super. Its nice to be able to replace & repair with original parts. Thanks WCCC ! 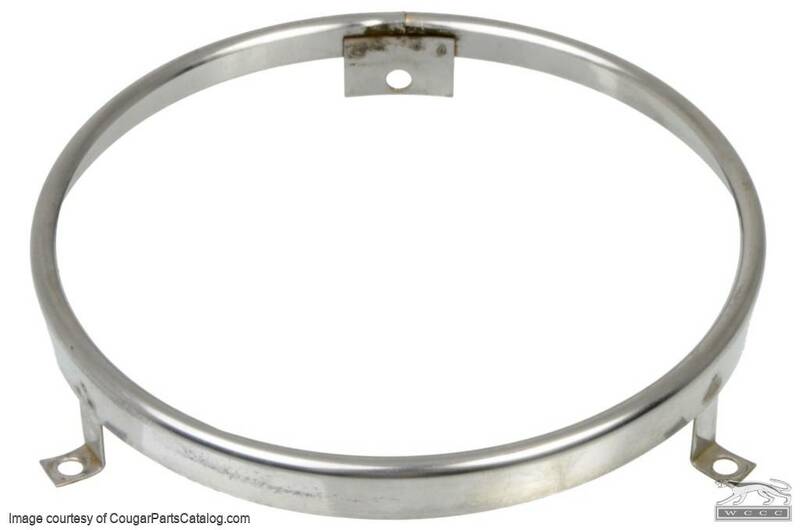 As these are the used actual rings off of our cars that WCCC had in their lot, they're the correct part for the car, in my case a '68. 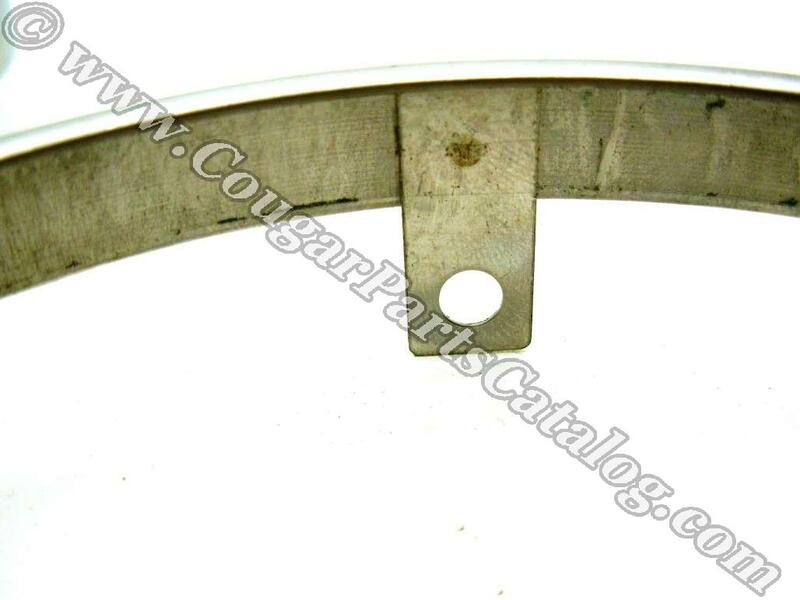 Unlike other brands and models of cars that use this setup for retaining headlight bulbs, the Cougar uses only two screws per ring plus a small spring as the third retaining point. If you're replacing a burnt out bulb, while the headlight cover is down, reach back and unplug the bulb that needs replacing(it's difficult to do when the cover is up). 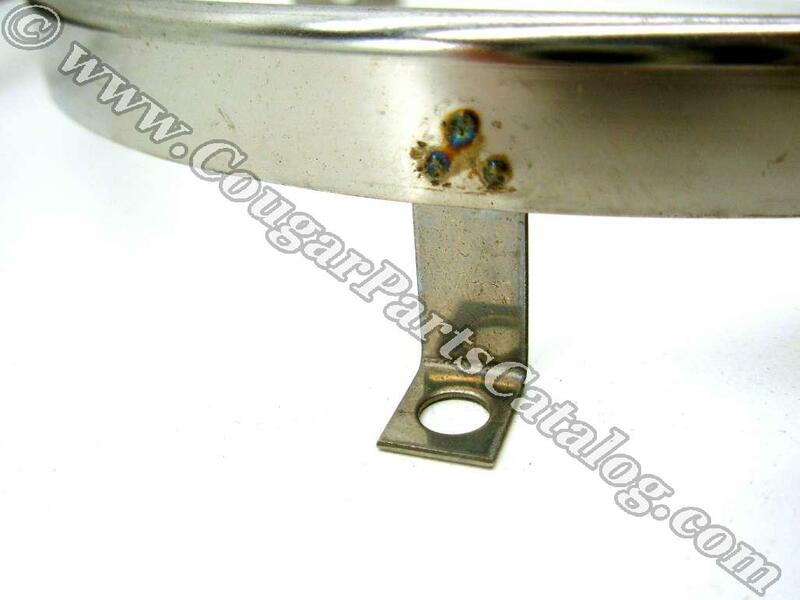 The '67 Cougar owner handbook has instructions and under the hood are releases for getting the covers to move out of position so that you can access the bulbs. On the '68, there are no releases and nothing in the owner handbook to advise you on how to move the covers. The shop manual(if you have one) tells you to first pull out the headlight switch knob as though you'd normally turn on the headlights. Then you may gingerly(by hand) pivot up the cover you need to move, and it will stay up while you're changing the bulb and/or the retaining ring. it took about 45 minutes to change one retaining ring for me, part of which was spent re-positioning the HL aim adjustment ring that the retaining ring mounts to. 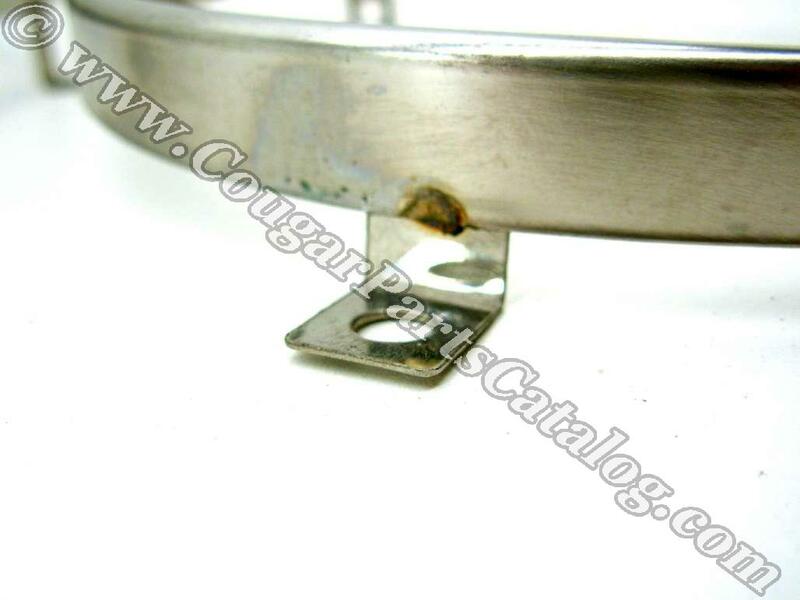 If your aim adjustment ring is properly attached, it'll take you less time. The package of rings came with all of the tiny screws you'll need to affix the retaining rings. I recommend using a magnetic Phillips screwdriver to keep the screws attached while swapping rings, as the tiny screws often get knocked off and lost inside the bumper/grille if you're not using a magnetic driver. After a little cleaning, they look great!